In the early 1840s, without the U.S. Government actively exercising jurisdiction over the Oregon Country, the early pioneers held a series of meetings at Champoeg to work out collective solutions to problems with wolves and crime, and to hash out how to handle the estate of one Ewing Young, who had passed away without a will. As more pioneers arrived, interest in self-government grew, and at one such public meeting on May 2, 1843, the Provisional Government of Oregon was established by a vote of those assembled. In 1848 the U.S. Congress created the Oregon Territory, and Joseph Lane, who President Polk had appointed Governor, arrived at Oregon City in March 1849. As provided for in the constitution, the Provisional Government of Oregon was dissolved as the U.S. government extended jurisdiction over the territory. 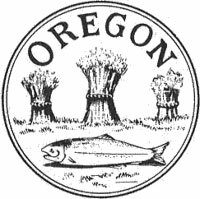 The Organic Laws of Oregon, which were drafted in late May 1843 by the provisional government, remained largely the law of the land (with several permutation) until the Oregon Constitution took effect with Oregon’s statehood on February 14, 1859.